It is the predella of the altarpiece above. 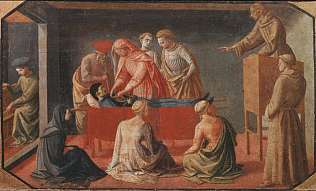 Two of the five panels are copies, since the originals (Saint Francis receives the Stigmata and Saints Cosma and Damian heal an invalid) are now in Paris. At the Uffizi since 1919.